The film documents the personal accounts of Ruhal Ahmed, Asif Iqbal and Shafiq Rasul (the 'Tipton Three');three young British men from Tipton in the West Midlands of Pakistani and Bangladeshi origins who travelled to Pakistan in September 2001 just days after the September 11 terrorist attacks in the USA, ostensibly to a wedding of a friend of theirs. While staying at a mosque in Karachi, the three decided to take a rash and dangerous trip to Afghanistan to see first-hand the encounters of the region. Mixed with interviews with the three men themselves, and archive news footage from the period, the film contains an account of the three men's experiences from their travels into Afghanistan and to their capture and imprisonment. 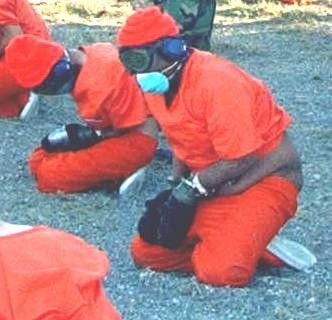 In January 2002, the 'Tipton Three' were declared "enemy combatants" by the US military, and flown with dozens of other alleged Taliban and al-Qaeda fighters to Guantánamo Bay, Cuba, where they remained for the next two years. They were held in mostly solitary confinement without charge or legal representation. The rest of the film shows several scenes depicting beatings during interrogation, the use of torture techniques such as 'stress positions' and attempts to extract forced confessions of involvement with al-Qaeda and the Taliban. The isolation continued from the Camp X-Ray where they were held as well as another camp. During two years they were subjected to more questioning by US army and Central Intelligence Agency interrogators. In one incident, one US army guard at Camp X-Ray desecrated one prisoner's Qur'an by throwing it to the ground to incite a reaction from the rest of the prisoners. In another incident, Ruhal witnessed a group of US soldiers severely beat up one unruly and mentally ill Arab prisoner for not obeying their orders. When Ruhal shouts out to the guards that the beatings and torture are in violation of the Geneva Conventions governing the treatment of POWs, he is responded with laughter from the guards who respond that those laws do not apply to enemy combatants. The Tipton Three were all released without charge and without any compensation for their imprisonment in 2004. The three were flown back to England where, one year later, they went back to Pakistan for the wedding they planned to attend in the first place. The torture depicted in the film had to be softened from the detainees' claims for the benefit of the actors; according to Rizwan Ahmed, they were unable to bear the pain caused by the shackles pressing on their legs, and had to have them cushioned. They were also unable to remain in the stress positions depicted for more than an hour; the Tipton Three claim they were left in them for up to eight hours. 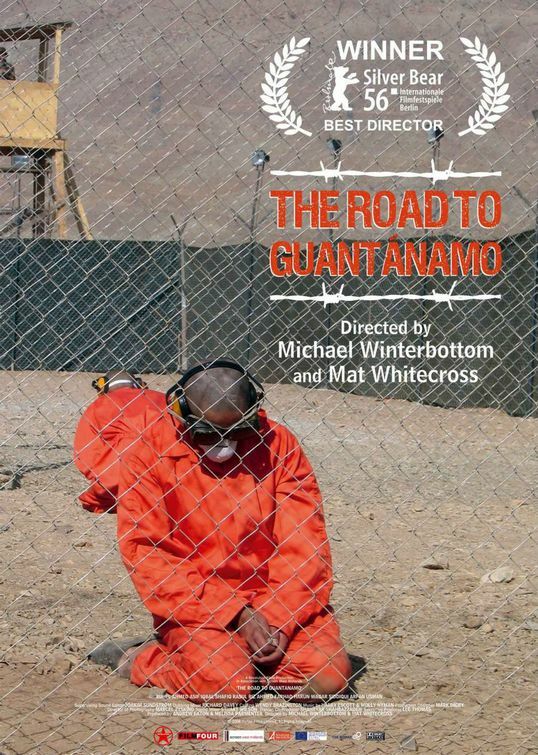 Ganadora del Oso de Plata en el Festival Internacional de Cine de Berlín, "The road to Guantanamo" es la historia de tres ciudadanos británicos que fueron mantenidos durante dos años en la prisión de la base militar estadounidense de Guantánamo, en Cuba. Los tres fueron eventualmente liberados y regresados a la Gran Bretaña, aún cuando nunca tuvieron cargos formales levantados en contra durante el periodo de su detención. El film ha levantado una considerable controversia debido a su postura crítica a los gobiernos de los Estados Unidos y el Reino Unido. Parte documental, parte dramatización, el film relata la secuencia de eventos desde la salida del trío desde Tipton, Inglaterra, hasta Pakistan, posteriormente cruzando la frontera hacia Afaganistán antes de la invasión estadounidense, su eventual captura por la Alianza del Norte, y su encarcelamiento en el campo X-Ray y el campo Delta, en Guantánamo.